Around 4 a.m. this morning a storm with winds between 70 and 100 miles per hour swept through Tama County, Iowa doing damage to real estate, infrastructure, vegetation and crops. At this time we are not aware of any fatalities or injuries. To view images of the consequences of the storm, click here. Rural Tama County, Iowa: some farmers believe that their corn yield will not bounce back over the next few days. Some believe it will but worry about harvesting a tangled crop. Debris from barns, grain bins, fallen trees, telephone and power poles etc. are scattered throughout the countryside as you drive up and down Highways 63 and 21. Also some damage to rural residential dwellings. Some debris are also on the road making it hard to move around the rural countryside. In addition to a number of gravel roads, portions of black top County roads E43, E29 and Hwy 8 have been closed for safe cleanup. Clutier, Iowa: Power outage. Community shelter is being erected. Downtown has suffered significant damage. Not much of the structure is left on the Clutier Fire station and City Hall. Tama-Benton Coop real estate in Clutier also received a beating. So did some residential homes. Most roads into Clutier have also been closed. For now, its best to use Highway 21 side to enter or exit. Extensive debris from fallen trees. Garwin, Iowa: Power outage. Red Cross has been deployed. Some damage to residential homes. Downtown the iconic bandstand and flag have been ripped to shreds. Grain bins are toppled and metal pieces sewn across the downtown park amongst the playground equipment. Many trees in town have been snapped in half or severely damaged. Dysart, Iowa: Power outage. Community shelter is being erected. Portions of the roof have been ripped off the Baptist Church and other residential properties. Shattered windows. Significant damage at the Benton-Tama Coop with grain bins and grain dryers getting toppled. Extensive debris from fallen trees. Traer, Iowa: Vacant Traer Manufacturing building’s 48 feet high ceiling area as well as portions of the south and east walls have been ripped open. Most of the in town real estate and vehicle damages has been caused by trees. Power has been restored in town. 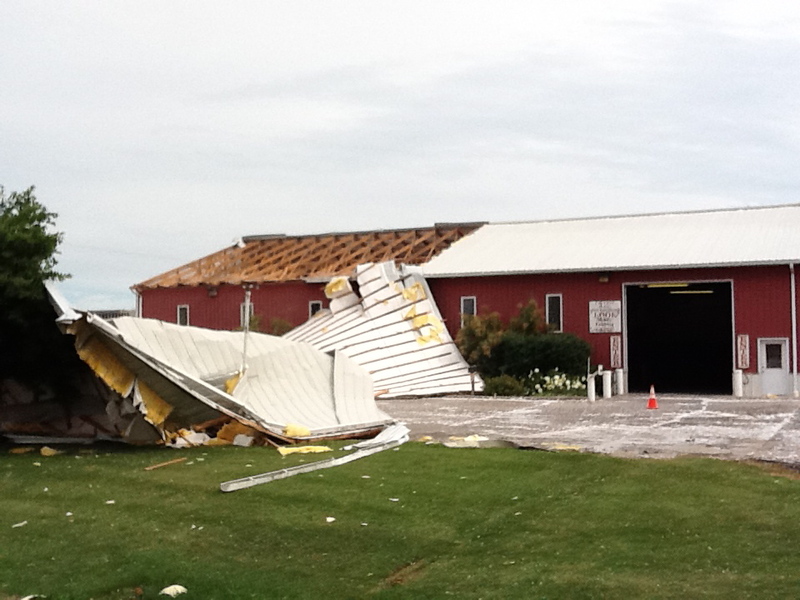 Toledo, Iowa: the roof on a Scharnweber business property on Highway 63 has been blown off. Tree limbs are covering the streets in the residential neighborhoods. Residential properties have been damaged. The iconic oak tree framing the Norma “Duffy” Lyon cow and calf sculpture has been broken in several pieces. Montour, Iowa: Power outage. Pilgrim Heights campers are all safe and already started cleanup. Bulldozers are removing snapped trees and brush. The National Weather Service will be conducting a damage survey of Tama County. So far Marshall, Story, Benton and Jasper Counties have also reported significant damages and power outages. Community College and a number of businesses are closed due to power outages, so please be patient. The power, internet wi-fi, primary roads and phones are up and working at the Reinig Toledo Center if you or a loved one need to find a safe public place to recharge your cell phone, recharge medical device batteries or access info on the internet. We updated the photo’s. More heartbreaking images from Traer, Dysart, Clutier, Garwin and the rural countryside.